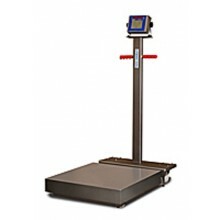 Scales.net features the best deals on floor scales, with many including free shipping within the continental US. Floor scales are the workhorses of many shipping and receiving operations. Capacities from 1,000lb to 10,000lb. Heavy structural tubular steel design. Heavy diamond tread plate deck. Top Access plastic NEMA 4x junction box. 100 lb. to 1,000 lb. capacity. Structural tubular Type 304 stainless steel construction. Environmentally protected, NTEP Certified-5,000 Division aluminum load cell.